Now that you know how often to repot your orchid you may also wonder when. Q: When is the best time to repot my orchid? A: At the start of a flush of new root growth. Because an orchid establishes very quickly in a potting medium during the part of its annual growth cycle when its roots are actively growing. In nature that span usually coincides with the onset of the rainy season. Many people are surprised to learn that tropical orchids have an yearly cycle of growth, flowering and rest--a cycle similar in some ways to the yearly growth cycle of temperate zone perennials, but more subtle. Orchid roots do not grow continuously throughout the year. How do you know when a potted orchid is producing a flush of new roots? They are not always visible. It's pretty easy, actually, to tell indirectly. Look for a new vegetative (leaf-producing) shoot on your plant. 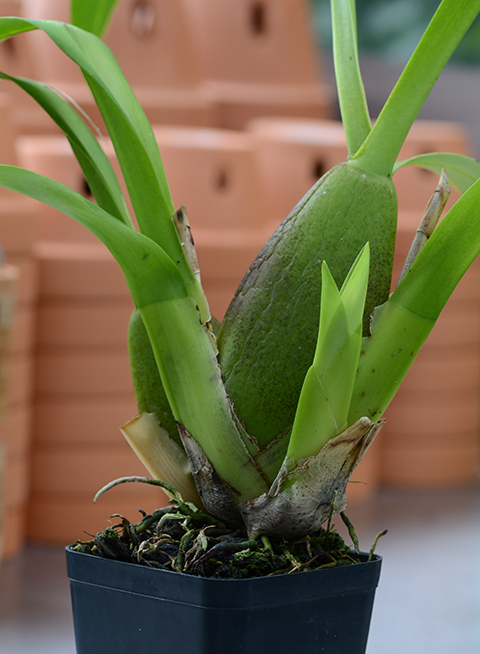 Most orchids produce new roots right around the time the new vegetative shoot appears. Think of the new shoot as a green flag signaling that it's time to repot. I have trained my eye to spot new shoots as I scan our orchid collection. When the new shoots are the size of my little finger, it's time to repot. 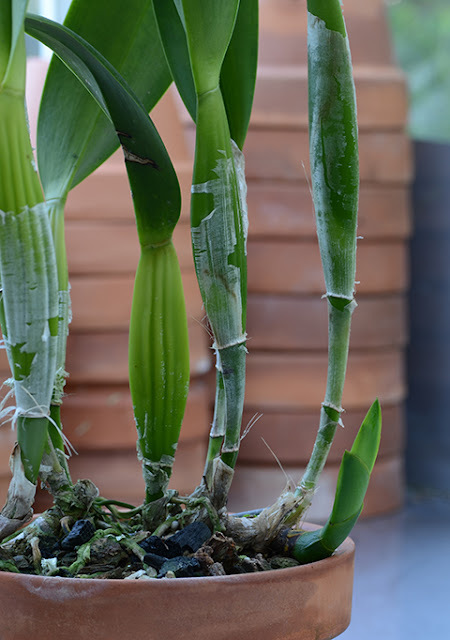 A new shoot on Laelia purpurata indicates that it's time to repot. Is it bad to repot during those months when the orchid's root system is not growing? It can be. 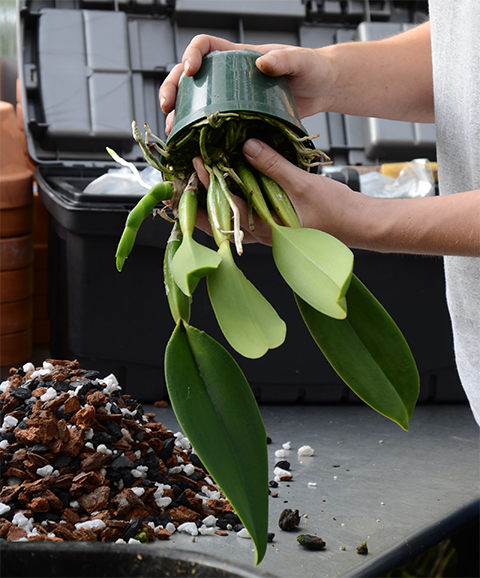 If you damage the root system--and it's hard not to inflict a little bit of breakage during repotting--you can impair the orchid's ability to take up water. It could be months before new roots replace the broken ones. In the meantime your plant may start to decline. 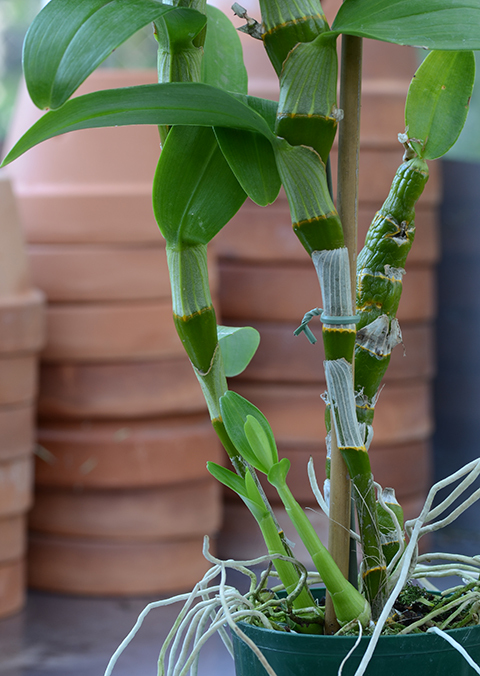 Two new shoots on a Dendrobium Red Emperor 'Prince' that is ready for repotting. 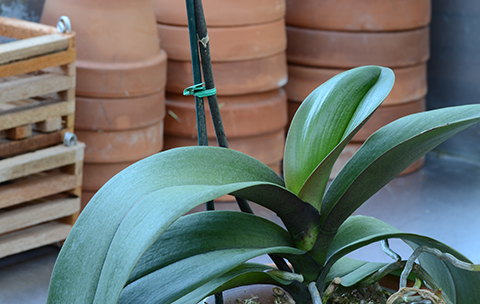 A green flag: the new shoot of an Oncidium intergeneric at the start of its growing cycle. Be careful not to confuse a young flower spike and a new leafy shoot! Some orchids produce a flower spike that emerges near the base of a mature shoot--in the same neighborhood as the new vegetative growth. A young spike and a young leafy shoot can look very similar early in their development. If you're not sure it's best to wait. Within a couple of weeks it should become obvious. What about orchids like Phalaenopsis (above) that don't produce a new shoot? When do I repot my Phalaenopsis? The best time to repot Phalaenopsis (and other monopodial orchids) is within a month or two after flowering. Coming soon: a review of commercial potting mixes for orchids.